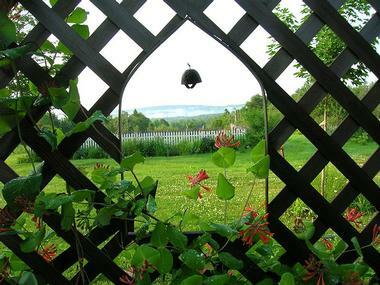 Rolling Meadows Yoga & Meditation Retreat is a secluded, hilltop retreat center set on 100 acres of beautiful landscapes over-looking the hills of coastal Maine. Presenting a quiet environment for spiritual renewal through a variety of deep relaxation practices of silent yoga, meditation and the untouched beauty of nature, Rolling Meadows promises a tranquil escape like no other. 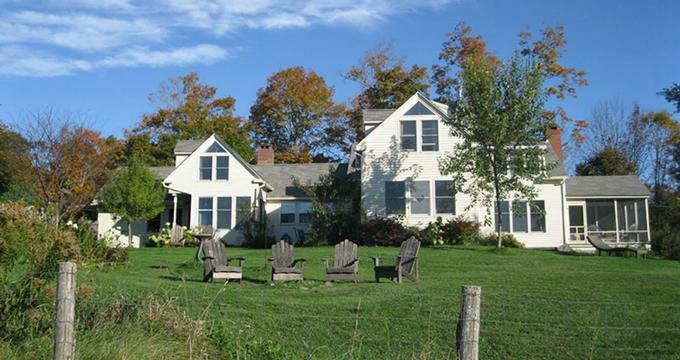 Situated 15 miles from the coastal town of Belfast, Rolling Meadows Yoga & Meditation Retreat offers comfortable accommodations in a beautifully restored 1840s New England farmhouse. The Center also offers a year-round schedule of silent yoga and meditation workshops and group classes for all ages and levels of experience from beginners to masters. 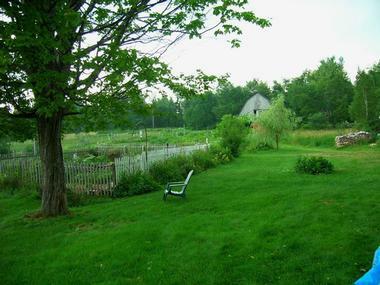 The surrounding rolling farmlands provide an array of activities ranging from hiking and walking trails, cross-country skiing, wood-fired saunas, lush gardens and a spring-fed swimming pond. 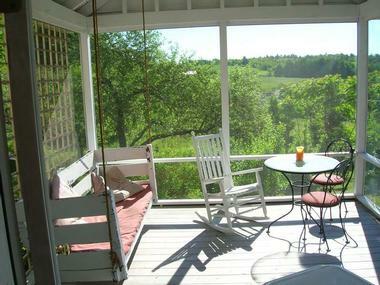 The 150-year old farmhouse boasts gorgeous views of the distant hills from its location on a high ridge and features comfortable guest rooms with country-style décor, private and shared bathrooms and modern amenities. Common rooms in the farmhouse include a library, sun room, living rooms and a screened porch where guests can relax and unwind, and extensive flower and organic vegetable gardens provide homegrown produce for freshly prepared cuisine. Rolling Meadows Yoga & Meditation Retreat is run by Patricia Brown and Surya-Chandra Das, who have been teaching yoga for over 35 years, both of whom offer a quiet, undistracted environment and years of expertise in yoga, meditation, and self-referenced practice. 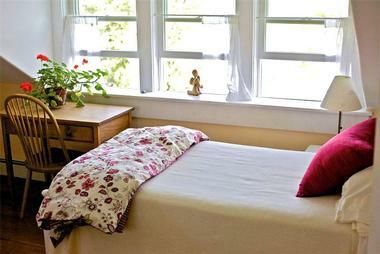 Rolling Meadows Yoga & Meditation Retreat offers comfortable accommodations in a beautifully restored 1840s New England farmhouse. The 150-year old farmhouse boasts gorgeous views of the distant hills from its location on a high ridge and features comfortable guest rooms with country-style décor, private and shared bathrooms and modern amenities. Guest rooms feature single or twin beds with clean linens, simple décor such as tables and chairs, and shared or private bathrooms with showers, sinks, and toilets. In addition to comfortable accommodation in the form of rustic guest rooms, Rolling Meadows Yoga & Meditation Retreat has inviting common rooms in the farmhouse that include a library, sun room, living rooms and a screened porch where guests can relax and unwind. Guests staying at Rolling Meadows Yoga & Meditation Retreat can enjoy wholesome vegetarian meals that are prepared fresh and served three times daily. Delicious cuisine is prepared using organic, locally sourced ingredients hand grown in extensive organic vegetable gardens on the property. The center offers a vegetarian menu of meals that include dairy, and eggs, and special dietary needs can be accommodated with advance notice. In addition to comfortable accommodation in the form of rustic guest rooms, Rolling Meadows Yoga & Meditation Retreat has inviting common rooms in the farmhouse that include a library, sun room, living rooms and a screened porch where guests can relax and unwind. An extensive flower and organic vegetable gardens provide homegrown produce for freshly prepared cuisine, which is prepared and served three times a day. The yoga and meditation room at the Center faces South, is flooded with natural light through large windows and boasts lovely views over the countryside, offering further relaxation from the beauty of nature. Rolling Meadows offers small group classes and workshops for all ages, physical abilities, and levels of experience in yoga and meditation. Rolling Meadows Yoga & Meditation Retreat offers a year-round schedule of silent yoga and meditation workshops and group classes, including traditional hatha yoga, restorative, and yin yoga, meditation, and pranayama. Shared silence is maintained during the retreats and group classes in line with the teachings of the center, except during the sessions and question and answer periods when guests can ask questions and learn more about the teachings. Silence is maintained to create a supportive environment in which to allow the body and mind to completely relax.